Our Best In SaaS-Reviews Cloud Picks of the Month. SaaS-Reviews prides itself in providing the best business to business cloud service reviews. 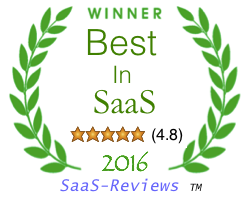 Every month SaaS-Reviews pulls from our best performing Cloud Picks and honors them with our “Best in SaaS” award. These are our top rated service providers this month. Salesforce cloud ERP is the best in the business. Salesforce sales cloud helps you close deals faster from anywhere, anytime. Vonage is a publicly held commercial VoIP and SIP company. It’s name is a play on word from it’s motto “Voice-over-net-age”. Marketo offers a web-based email marketing platform for companies of all sizes, to form and preserve engaging customer relationships. Top performers receive the prestigious SaaS-Reviews “Best in SaaS” award. Our Best In SaaS Award is reserved for those cloud companies that really deliver on their promise of excellence. SaaS-Reviews.com makes the choice simple for you by providing a comprehensive look at the leading business to business cloud services. Let us do the research for you, so you can make an educated choice for your business’s cloud service provider.